The topic we’re focusing on in today’s post is something that can cause many a person’s blood to run cold – the wedding speeches. As while seen as a highlight of the day for guests, for the members of the bridal party who actually have to deliver them it’s an honour that often comes with a side-helping of fear! Watching my fiancée painfully deliberate over how to approach a best man speech recently made the thankful that, as a female, such a duty wouldn’t be bestowed on me. Or so I thought! In May my brother Dan is getting married *lets off party popper* and I’m his best woman, oh wait, that involves a speech! Furthermore, having now had a ring put on my finger, I’m rather drawn to the growing trend for brides to have their say from the top table too. And so, it appears I could well be in the bright speech spotlight not once, but twice, in the next 18 months. As such I will be paying particularly close attention to our uber-skilful, new Sponsor that we’re introducing on the blog today, public speaking coach Emma Taylor of Emma Taylor Presents. 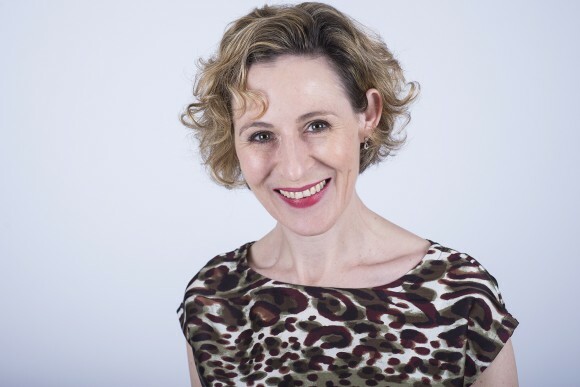 With a successful background in scriptwriting and acting, Emma set up her business to deliver training courses and coach individuals in public speaking and presentation skills, which she has now extended to include professional guidance and advice on the construction and delivery of wedding speeches. What a fabulous idea we hear you cry, and we couldn’t agree more! 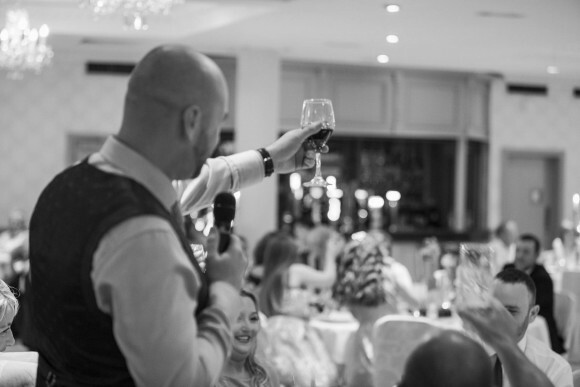 With one-to-one coaching and group workshop options for everyone from the best man, groom and father-of-the-bride, to any females that want to take to the mic too – brides, matrons, mums – Emma can help turn a fearful task into a truly wonderful experience. And she’s taking over the blog this morning to tell us just how she does it – pens and notebooks at the ready! READER OFFER – Emma is offering Brides Up North readers a 10% discount on group workshop attendance in Leeds, Manchester and Liverpool during March, April and May 2018. Full details below. You’ve been providing public speaking training for MPs, senior managers and even members of the clergy for over a decade, so how did you come to add wedding speech coaching to your portfolio of services? emma says: It was after attending a wedding last year. At it, the best man spoke for too long and repeated some of the groom’s material, the father-of-the-bride was barely audible and never once looked at the guests, and when the bride was asked to say a few words, all she could manage was a clichéd, “thank you all for coming”. The speakers clearly needed help, but they’d not had anyone to turn to, and that’s when I thought, ‘I could be that person’. Can you tell us a little about your background and how Emma Taylor Presents came to fruition? While I was studying for my MA in Scriptwriting, I worked part-time as a PA. As part of the job, I attended lots of meetings and witnessed lots of poor presentations. One day, in the car on the way back to the office, I happened to casually remark that if these presenters understood a little about dramatic structure and were given a few acting skills, then their presentations would be greatly improved. The following morning, my boss strode into the office and announced, “I had dinner with the Chair of Salford Royal last night. He’s a dreadful public speaker. I’ve found you your first client!” My initial reaction was horror. But then I decided to put my money where my mouth was and deliver the coaching. Anyway, post coaching, everyone noticed the transformation and my business grew by word of mouth mainly. Can you tell us a little about the various wedding speech training packages you offer? I offer three different training options: One-to-one coaching, a bridal speech party and open group workshops. The one-to-one option is ideal for wedding speakers who are time-poor, very inexperienced or very scared about giving their speech. The service generally comprises two meetings. The first meeting is to sketch out the speech and agree its content. The second meeting is to rehearse the speech. In between sessions, I will pen the speech which the client is encouraged to tweak so that he or she finds it natural to say. The bridal speech party brings together the wedding’s key speakers: best man, groom, bride, father- or mother-of-the-bride and, sometimes, the maid of honour too. It’s always a lively, jolly and productive affair. 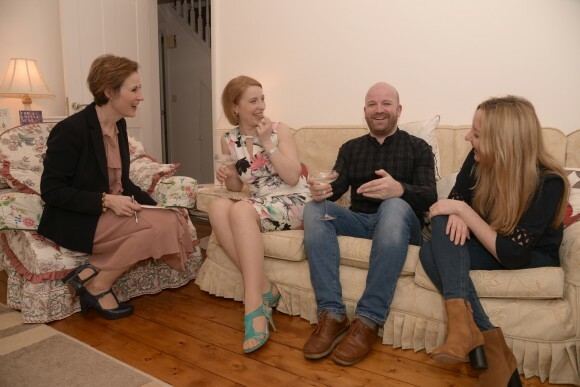 Over a glass of fizz, participants get to suggest ideas, share anecdotes and structure and/or rehearse their speeches. The party also presents a wonderful bonding opportunity. It usually lasts four hours. I offer two types of group workshops: Simply the Best and Welcomes, Wishes and Cheers! Simply the Best is designed for best men, best women and maids and matrons of honour while Welcomes, Wishes and Cheers! prepares fathers and mothers-of-the-bride, grooms and brides for the public speaking task that awaits them. The workshops are three hours long and will run in venues in Manchester, Liverpool and Leeds during the spring. How would you say wedding speeches have changed over the years and what makes a good speech in today’s modern world? I don’t think the remit of wedding speeches has changed but I think guests’ expectations have. So, if a couple is throwing a large, no-expenses-spared day, then guests expect the speeches to top the wonderful wedding breakfast, and if they don’t, there’s a sense of flatness and disappointment. Of course, more women speak at weddings today. It’s quite common now for a mum to deliver the ‘father-of-the-bride’ speech and more and more brides are choosing to take to the mic – Meghan Markle reportedly being one of them at. Matrons and maids of honour are also leaping to their feet and all of this is to be encouraged. Guests love it when the girls get involved. However, because the bride’s and maid of honour’s speeches aren’t traditional ones sometimes they lack a sense of purpose and can meander. My coaching addresses this and gives brides and maids of honour a sound but simple steer. 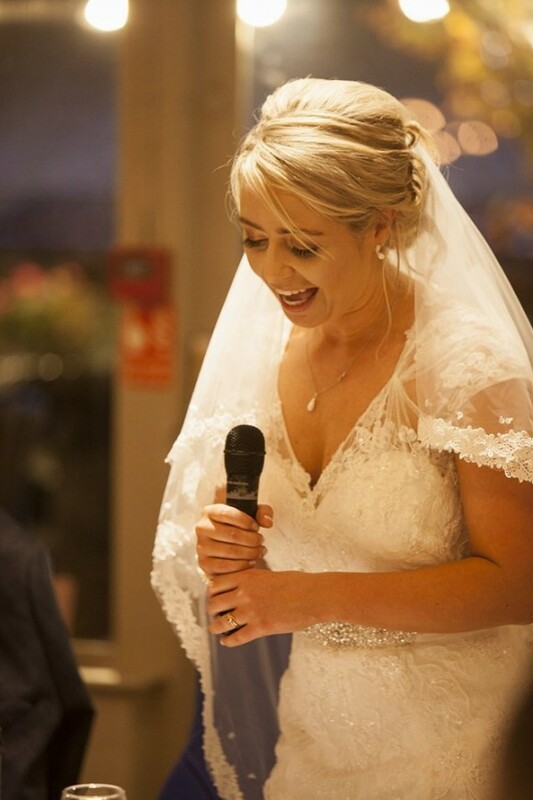 Even if a bride hasn’t intended to give a speech, she’s regularly called upon to say a few words, so I’d always advise her to have a short speech prepared. Remember, the best seemingly ‘off the cuff’ speeches have usually been given an awful lot of thought! What would you say is the most common mistake made when constructing and delivering a speech? In constructing, worrying so much about it being funny that the speaker gets his or her jokes off the internet. Audiences can sniff this a mile of, and they don’t like it. What they want to hear are truthful stories and familiar, funny observations that really capture the personality of the bride or groom. In terms of delivery, a lot can go wrong, but I think my biggest bugbear is when speakers just read out their speeches with their heads down. The audience wants to see the speaker; guests want to feel that the speaker is looking them in the eye. Interaction is everything! What would be your top tip to help people overcome their public speaking nerves? Remind yourself of all the preparation you’ve done. An exam isn’t worrying if you’ve revised, and a speech will go well if you’ve prepared. Remember those hours you put in. What is the feedback like from those that you have helped with a wedding speech? It’s been excellent. And of course, what’s important to my clients is the feedback from guests at the weddings they’ve spoken at – which has also been really good. I think clients like my firm but fun approach. Once we start working on their speech, they go from dreading it to feeling excited about it; a sentiment they didn’t believe was possible! 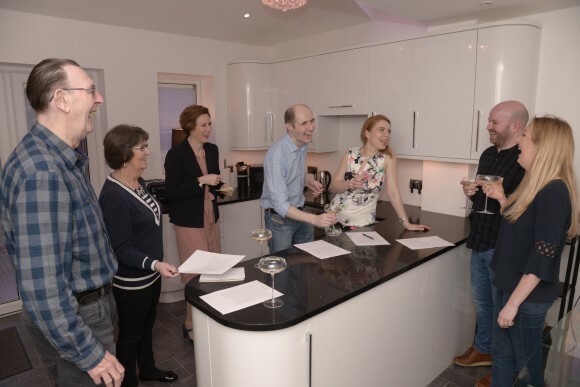 Clients benefit because I’m not just a professional scriptwriter, but I also trained as an actor, so I’m able to help them in the prep and delivery of their speech. They trust my feedback and they respect my perfectionism. I want their speech to sparkle as much as they do. Can you give us an idea of the price of the packages available? The complete one to one package is £550. The bridal speech party is £475. Attending a group workshop is £75 per participant. I’m pleased to offer Brides Up North readers a 10% discount on group workshop attendance during March, April and May 2018. Subject to terms and conditions. Do you have any dates of planned workshops that you can share with us? As mentioned, I will be holding workshops in Leeds, Manchester and Liverpool during the spring. Dates and details can be found here. They can visit my website,email me at emma@emmataylorpresents.co.uk or call 07973 933782.